The summer leaves had gone, replaced by the gold, yellow and brown of autumn. Mabel and her lifelong love, William, sat hand in hand enjoying the warming sun. 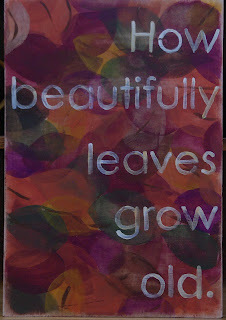 “How beautifully leaves grow old,” William suggested. “If only I were as beautiful as the autumn leaves,” Mabel sighed. Graphic accompanying the Centus pompt. This is such a sweet. .. tale of autumness ! He’s a keeper! Thanks for the comment and my apologies for the long delay in reply. I have a photo taken of an elderly couple standing hand in hand under some trees. While the photo is nothing special the image of a couple so close was. Lovely, Ross. Mine is a little like yours! Awww. What a lovely sentiment. Nice to grow old together…. I think I might be in love with William. Great writing…when you see with your heart there is no place for gray. Thanks for the comment and my apologies for the delay in replying.